The tube segment which terminates in the bell. This may include the bow next to the bell (bell bow). The first section of tubing of a brass instrument extending from the mouthpiece receiver to the next joint. It usually tapers, unless it is equipped with a tuning slide. In the construction of brass instruments, either an additional strip of metal called a garland (Nos. 3 and 5), an iron or brass wire (Nos. 6 and 7), or both (Nos. 1, 2, and 4) are used to create a rim to reinforce and protect the thin edge of the bell. The wire may be soldered onto the top of the bell (No. 6) or onto the garland (No. 1). Alternatively, the edge of the garland (Nos. 2 and 4) or the bell edge itself (No. 7) may be rolled around the wire. The regional attribution of these rim types indicates the regions in which they were first or most frequently used; however, they are often found outside these specific regions. * Based on the research of Herbert Heyde, Trompeten, Posaunen, Tuben (Leipzig: VEB Deutscher Verlag Für Musik, 1985), p. 239. 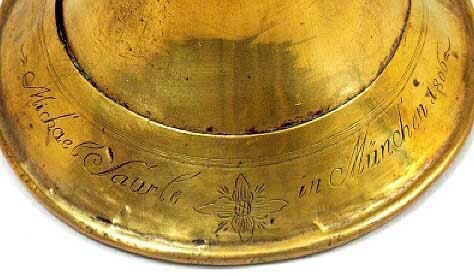 A natural trumpet with internal crooks by Michael Saurle, Munich, 1806, features a Saxon rim--a bell garland rolled around an iron wire. Ferrules, covering the joints of tubing in brass instruments, often display some kind of decoration. The most frequently used decorative feature is engraved rings or lines. While engraving removes metal, impressing or embossing rearranges it. A sharp steel tool is used to engrave a ring, while impressing can be done with a rounded tool with no sharp edge. Embossing rearranges metal to certain shapes with the help of forms by using pressure; no metal is removed. Coins, for example, are embossed. Embossed wire of a Nürnberg rim found on a natural trumpet by Johann Wilhelm Haas, Nürnberg, ca. 1700. Tabs or small notches may be cut into one side of the bell during its construction to strengthen the seam at the flare. These tabs are alternately bent upwards and downwards and linked to the opposite straight side of the bell's edge. 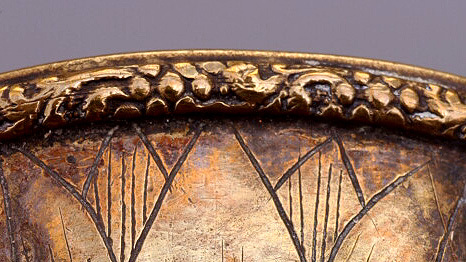 The tab pattern often remains visible after the bell is soldered and polished; however, plating usually makes the tabs invisible. Seraphinoff, Richard, Raymond Parks, Robert Barclay, and Jenny Nex. Making a Natural Trumpet: An Illustrated Workshop Guide. Edinburgh: Edinburgh University, 2003. Valves on brass instruments are mechanical devices that alter the tube length by a fixed amount in order to change the pitch while playing. The first valves were invented in Germany about 1814; subsequently, valve designs have been altered and refined in many different ways. The normal valve order today lowers the pitch a whole tone (first valve), a semitone (second valve), and a minor third (third valve). In the course of valve development, other sequences were also used, as described in the various brass instrument checklists on this website. Heyde, Herbert. Das Ventilblasinstrument. Leipzig: VEB Deutscher Verlag für Musik, 1985.